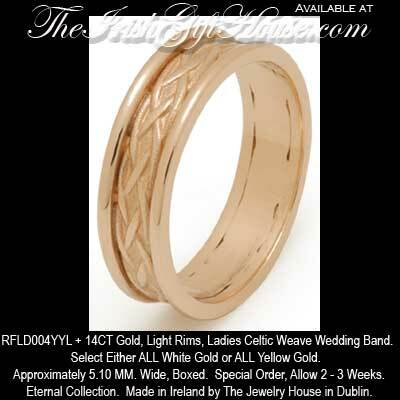 Eternal Celtic Wedding Bands - Celtic Weave, Select Either 14K White Gold or 14K Yellow Gold. Select Either White or Yellow Gold. Free shipping on all orders over $500.00! Ladies Celtic Weave Wedding Band. Select Either ALL White Gold or ALL Yellow Gold. Approximately 5.10 MM. Wide, Boxed. Special Order, Allow 2 - 3 Weeks. Made in Ireland by The Jewelry House in Dublin.